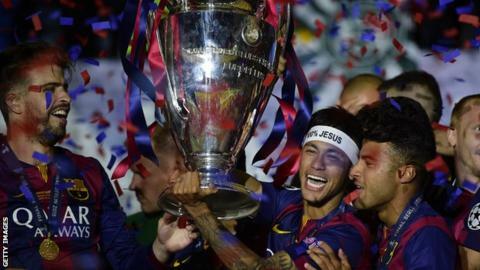 The Champions League may feature fewer teams in the group stages under proposals being considered by Uefa. One suggestion is for more knockout rounds, leading to two 'super-league' groups of eight teams - the current format features eight groups of four. A spokesman told the Guardian Uefa was in "constant contact" with clubs but "no concrete proposals" were in place. The current structure is unlikely to change under the present TV rights deal, which runs to the end of 2017-18. The Champions League replaced the European Cup, which was a straight knockout competition, in 1992. There are currently three qualifying rounds and a play-off round, all played over two legs, then the group stage which features 32 teams divided into eight groups, with the top two in each group advancing to the knockout round of 16. The European Clubs' Association, led by former West Germany international striker Karl-Heinz Rummenigge, has held discussions regarding a tournament consisting of 20 teams from Italy, England, Spain, Germany and France. Inter Milan chief executive Michael Bolingbroke told the BBC this week that he saw merit in the idea of Champions League wildcards for teams that have not qualified through their league position.